Dental Implant Overseas - Ins and Outs! Currently, a lot of Australians are opting to get their teeth implants done overseas. This is mainly because of the perception that the implants are cheaper if done overseas. However, there are many risks associated with opting for overseas implants, which could affect the outcome of the process. At Tooth Implant Sydney, we are able to match the low prices abroad without sacrificing the quality of services. So, you need not travel out of your comfort zone to avail the treatment. Just as any surgical / invasive process carries inherent risks, the tooth implants also carry an element of risk. Hence, it is vital to avail the services of a surgeon you can trust absolutely. Such a person would be able to offer you precise care and excellent treatment to get the best results. At Tooth Implant Sydney, we offer you the services of surgeons you can trust. Why people opt for dental implant overseas? 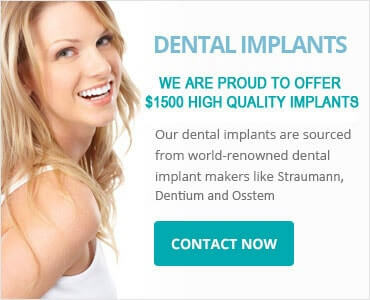 Price – People believe that the costs involved in dental implant overseas are lower than the cost in Australia. While it might be true in many cases, there are many affordable implant treatments available in the country itself. At Tooth Implant Sydney, we offer affordable services without the risks connected with dental tourism abroad. Security – The Australian dental implant clinics and practitioners are bound by the strict health and safety codes as directed by the Australian Dental Board. While this ensures good service standards, it also offers the customers automatic safety against malpractices and unethical practices. More importantly, in the unlikely event of something going awry, you will get legal protection. This may not be the case if you opt for dental implant overseas. The rules and regulations, as well as laws, differ from country to country. Above all, there is no guarantee that your rights would be protected there. In addition, the Australian health insurers do not accept any claims for dental implants overseas. In short, the risk involved is huge. Reliability – Dental implants are such treatment procedures, which require periodic, if not on-going support from the dentists. This support may not be available in case of an overseas dental implant. Moreover, it is not at all economical to travel back and forth to the country in which implant was done every time you have a toothache. The recurring nature of treatment that requires multiple visits to the dentists make the overseas dental implant one of the impractical procedures for an Australian. Hence, it is always advisable to opt for local services. And, for dental implants in Sydney, there is no better choice for you than the Tooth Implant Sydney. If you are still unconvinced and are wavering between local and overseas dental implant surgery, give us a call. We shall help you in comparing the cost and convenience between local and overseas implant. Our charges are affordable and we offer one of the most economical dental implants prices in the whole country.